In case you missed the biggest shopping announcement of the week, Apple has released the new iPhone 5. The iPhone 5’s new A6 SoC or processor is about twice as fast as the iPhone 4S’s A5 chip. It can also handle graphics twice as fast as before. The iPhone 5 now supports HD voice with three microphones and there is a loudspeaker that is about 20 percent smaller than before. The other small but cool feature on the new iPhone 5 is the Lightning dock connector. At about 80 percent smaller than the older 30 pin dock connector, the new 8 pin Lightning dock connector is a dramatic shift but is consistent with rumours that have been around for the last year or so. The good news for theses of us with older dock connector accessories, is that Apple will sell an adapter for iPhone 5 users to use to connect to older first and third party accessories. The new 4 inch 1136 x 640 display on the iPhone 5 takes a cue from competing phone manufacturers such as HTC, LG and Samsung. With a 16:9 Aspect ratio and deeper saturation of colours, the new screen is nothing short of a great display. And it still produces the same 326 pixels per inch that the iPhone has been known for since the iPhone 4. The new 8 mega pixel iPhone camera is both faster and smoother in its photo capture. It is able to capture photos at about 40 percent faster than previous generations and also has a slick feature which allows users to take still photos while recording 1080p video. One of the best features of the new iPhone 5 has got to be the worldwide LTE connectivity. 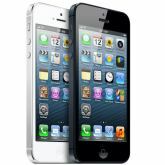 In the United States, new iPhone 5 owners will be able to connect to AT&T, Sprint & Verizon. The new iPhone 5 has what Apple described as a “dynamic” antenna. The iPhone 5 should be able to get about 8 hours of use on LTE. 4) It Ships Next Week! The new iPhone 5 will start at $199 for the 16GB model, $299 for the 32GB model and $399 for the 64GB model. The new iPhone 5 ships September 21st.